When you purchase Earth's Pearl Probiotics today here's what you should do. When that smiling little Amazon box arrives at your front door, rip it open the first chance you get. Take out your Earth's Peal Probiotics and admire the shimmering blues and greens on the very clear label. You have in your hands the world's best probiotic that's made in the USA, non GMO, lactose free, for Women, Men and Children. Now pop open that lid and grab an easy to swallow pearl and gulp it down with your favorite drink - water, almond milk, or whatever. Get feeling better ASAP. Marvel at the smooth texture and no foul taste as it slides down your throat. In fact most people say it's the easiest pill to swallow and fastest acting. What separates Earth's Pearl Probiotic from the competition? It's simple really it goes back to the 1900's when Russian scientist and Nobel Prize winner, Elie Metchnikoff discovered these villagers in the Caucasus Mountains that were living much longer and healthier then the rest. It was due to Lactobacillus bulgaricus and later acidophilus and Bifidobacterium infanti. Now BIO-tract TM gastric bypass technologies ensures delivery passing the almost impeccable gastric acids that leave all other probiotics, food and yogurt products just pointless. It's because of this we are able to make a guarantee unlike any other you've seen before. Use 1 pearl or all 60 for 365 days and if you still don't feel the difference return it for a FULL refund no questions asked. That's how confident we are you will be happy and coming back for more. For uninterrupted usage grab 1 for the house, 1 for the go and 1 for each family member. Increase the bacterial profile in your stomach: Billions of live micro flora (good bacteria) will settle and grow within your gut. May contain traces of milk Protein. Pearls versus capsules: The Time Release Patented Technology, BioTract that is in our easy-to-swallow pearls makes them 15 times more effective than regular capsules, delivering 15X more live bacteria into your intestinal tract. Relief from gas pain: A healthy gut needs a lot of beneficial bacteria. Probiotics may help alleviate symptoms from allergies and digestive disorders. Boost immunity, energy & mood: Improved vitamin absorption means a big boost to your immune system! 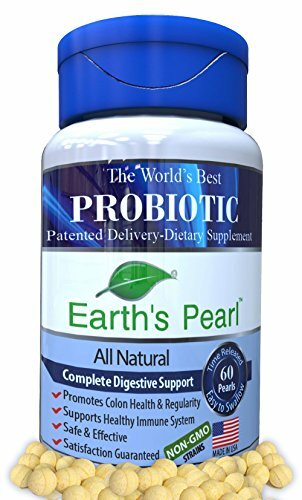 Earth's Pearls Probiotics also protects the body from yeast overgrowth and improves digestion which contributes to overall wellbeing and best of all more energy. Make your supplements and food count: Ideally, most of our nutrients should come from the foods we eat, which can only happen with proper digestion. Earth's Pearl Probiotics supports and improves healthy digestion, which improves the bio-availability of nutrients from the healthy foods and supplements you are taking. Finally a probio tic that won't leave your pocket book feeling slim. If you have any questions about this product by Earths Pearl Probiotics, contact us by completing and submitting the form below. If you are looking for a specif part number, please include it with your message.